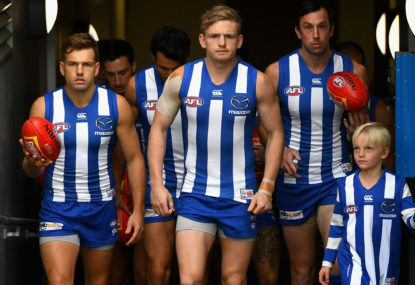 So, after one game for each women’s team in the AFL, we can confidently erase all of our pre-season predictions and announce that the Kangaroos will be the 2019 premiers. The Fremantle Dockers were severely underrated, and every single match that doesn’t involve Carlton will be a nail-biter. Or… we could wait and see some more games before leaping to conclusions. But that’s not nearly as much fun, now, is it? Seriously, the only thing the league could have asked for beyond the female replay of last season’s men’s R20 is for all the goal-behind ratios to have looked more like the Fremantle-Melbourne 17-goal onslaughts and less like the combined 3.21 Bulldog win over the Crows. But even in that still-tense 18-17 game, the kicking was obviously better than Round 1’s looked the previous two seasons. How much of that is due to rule changes opening up the ground and how much can simply be attributed to improved skill sets among the players is still up for debate, but since we’re in the business of overreacting right now, let’s just declare that this will be the best season ever for showcasing the talents of the players. Here’s a quick look at the Round 2 games this weekend, including both punter point-spreads (for a sense of comparison; we’re not recommending you bet real money) and our “ELO-Following Football” rating system predictions. Bookies: ‘Roos by 7.5 points. But compare opponents – Carlton’s women’s team, sad to say, is on a six-game losing streak, and the average margin of the previous five Blues losses was 35.2 points, which is right about what they lost to NMK by last week. That implies the Kangaroos did what they were supposed to do, nothing more. Meanwhile, GWS took the two-time grand finalist Brisbane to within two points in Brisbane. Their most recent game for premiership points, coincidentally was R7 last season, also against Brisbane. That game was a home game for GWS, and they lost to the Lions by 40 points. While the Lions lost a player or three from last year, they’re still one of the favourites for the 2019 title, and GWS showed they’re right up there with them. Amanda Farrugia of the Giants leads the team out of the race. So while it may be tough to bite the bullet and pick the Giants to win (I picked one of each in the two tipping contests I participate in), seven points seems too big a gift. The Kangaroos might win by 36 again this week – or they might lose by that margin. I wouldn’t put money on it being another game like their Carlton rout, though, or even an eight-point game. 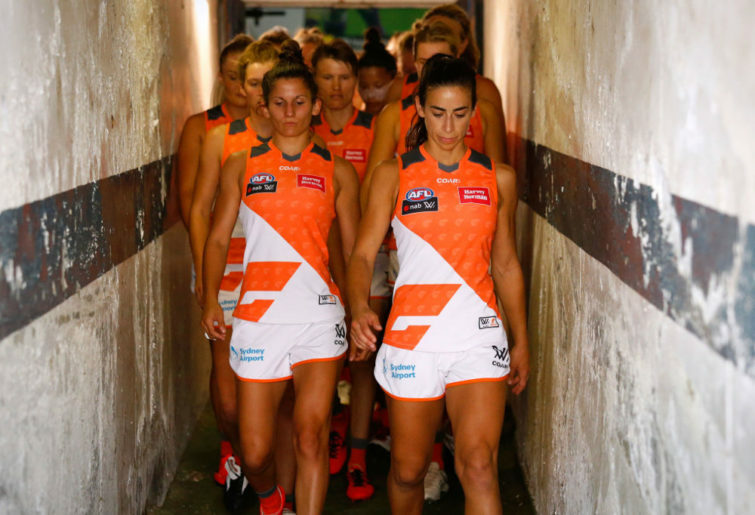 The top vote-getters across the various forms of media for each team during the first round of action were Cora Staunton and Alyce Parker for the Giants, while for the Kangaroos they were Emma King and Jasmine Garner, with Ash Riddell right behind them. 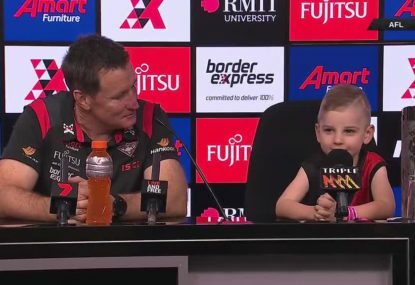 Bookies: Demons by 7.5 points. ELO-Following Football says: Magpies by 2.4 points, with a caveat. What’s the caveat? It’s the same thing everyone else with a mathematical rating system that carries over from previous seasons will warn you about with regard to Collingwood. 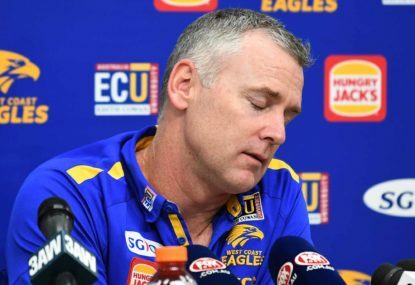 Given the tremendous player losses they suffered since last March, the momentum they had going at the end of the 2018 season should not carry into this year, and their loss to a newborn Geelong club demonstrated that. They’re still decent, but the truth is that while they’re probably not 7.5 points worse than Melbourne (which lost by addition – specifically, the impending addition of a baby Daisy), they probably aren’t 2.4 points better, either. I’m personally tipping Melbourne to win, though not by that margin. 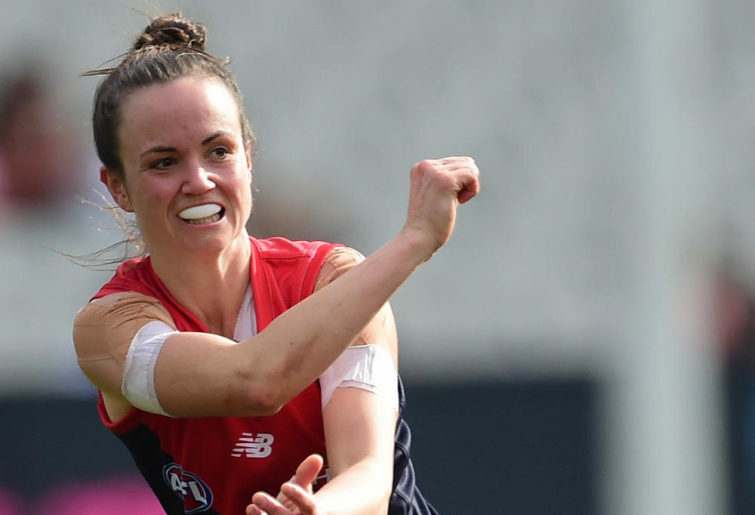 The top players for each squad through Round 1, in the meta-Player of the Year standings, were Karen Paxman and Lauren Pierce for Melbourne, and Ash Brazill and Jaimee Lambert for Collingwood. 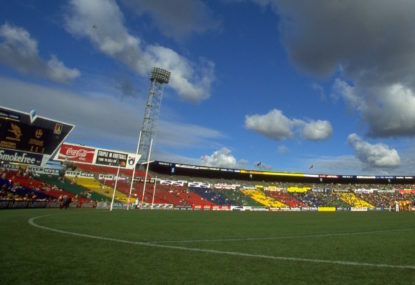 Cats (1-0) at Bulldogs (1-0), Saturday, Whitten Oval in Footscray. Bookies: Doggies by 4.5 points. ELO-Following Football says: More like 13.7, don’t you think? The impression that the season-opening game against Collingwood gave me, frankly, was that the two teams were fortunate to be playing each other (much the same as the two previous Carlton-Collingwood openers felt, now that I think about it). They may very well end up as the number eight and nine teams in the league, depending on how and if they gel. Meanwhile, Footscray got the better of an Adelaide team that should easily beat both Geelong and Collingwood this season – so why shouldn’t they defeat the Cats themselves? While they kicked terribly last Saturday (and were only bailed out by the Crows’ equally abysmal aim), they outplayed the 2017 champs and deserved to win last week. I don’t know if the Bulldogs win by 14 points as our ratings suggest, but I’m taking the points and the Doggies without thinking twice. The chocolates went to Ellie Blackburn and Lauren Spark across the media pronouncements for the defending champs last weekend, and for Geelong the top recognition went to Nina Morrison (the highest vote-getter in the league right now with 39 points) and Meghan McDonald. Bookies: Crows by 7.5 points. ELO-Following Football says: Aw, isn’t that cute? I can’t find a single rating system that has this game within eight points. ELO-FF says it’ll be 15 in Adelaide’s favour, and as discussed earlier in the Kangaroos’ piece, that would probably be a victory for Carlton if they kept the game within three goals. But here’s the thing – with the situation the AFLW is in, where players and coaches come in for three or four months “from their day jobs” to create a top-notch competitive team after having played in the various (pardon the adjective I’m using for convenience) “lesser” state leagues the rest of the year, we’ve seen where a team suddenly figures it out between rounds. Last season, Collingwood went 0-3 against the three weakest teams to start the year, and came out in R4 and annihilated Melbourne 58-24. They then beat both of the prior year’s finalists handily and ended the season armed for bear. There’s no reason that can’t happen to Carlton. Their talent is in place – the top vote getters in R1 for the Blues were the young stud Madison Prespakis, followed by Jess Edwards and Brianna Davey. Add the highly skilled Tayla Harris in there alongside Sarah Hosking and AFLW goals-in-a-season record holder Darcy Vescio, and you’ve got the tools you need there. Most observers I read thought the problem last week was where the personnel were playing, not in the players themselves. 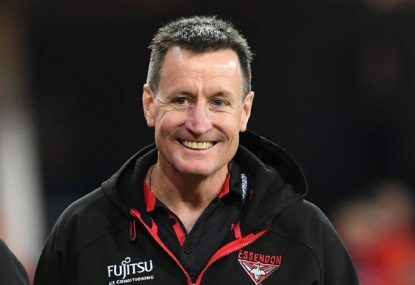 It’s easy to imagine Carlton coming out some week having sussed what needed to be fixed and routing some unsuspecting club fighting for the finals, the way the Pies did last year. But until I see it, I can’t tip that way. Adelaide should win big this weekend behind its leading vote getters, Ebony Marinoff, Erin Phillips, and Anne Hatchard. Bookies: Brisbane by 1.5 points, the closest spread of the weekend. ELO-FF says: Brisbane by 1.2 points, the closest spread of the weekend. I say: forget what they say. Did you see the Dockers play last week? Only three teams kicked more goals than behinds last week – but Melbourne (8.7) and GWS (4.3) just barely did, and in losing efforts. Fremantle, however, has been training to play basketball on grass – and not just basketball, but fast-break basketball. And when you play an up-and-down game like that, several things happen, not the least of which is that your shooting percentage goes up. Freo kicked nine-goals-five last week, by far the most accurate, and mostly that’s because the shots they got were better than those most teams got. You also have to be in good shape to do that, and doubly so when you play in 38-degree heat. Fremantle was in good enough shape to score the last three goals on Melbourne last week in that heat, so… check. 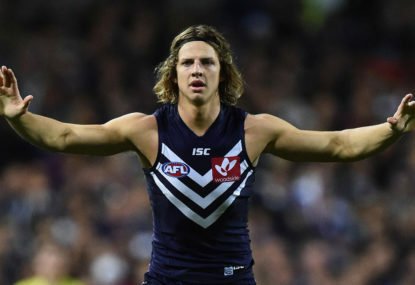 Finally, you have to have players who know their roles and where to be, and for a R1 game, the Dockers were remarkably disciplined in that regard. Kiara Bowers and Ebony Antonio were on point for the purple last Sunday, Ashley Sharp and Gemma Houghton were ready inside the arc to finish with two goals each, and new coach Trent Cooper has reignited the entire team to believe it can beat anyone, anywhere. You can see it in the way they play, even down to the showhorse of the league last week by 14 at the last break. But Brisbane’s made both grand finals so far in the young history of the AFLW for a reason, and they too can come back from behind. Behind Ally Alexander, Jess Wuetschner, and Emily Bates (all in the top ten vote-getters so far this season), the Lions came back from a seven-point halftime deficit to hold off a fast-charging Giants team. Sabrina Frederick-Traub continues to grow as a dynamo wherever she plays, and from the looks of it she’s willing to ruck, midfield, kick goals up forward and slam back into defence when called upon. I had the Lions returning to the grand final again this year, and I still see them as the class of “conference B” (hate those designations!). I also had them winning this game easily in my pre-season breakdown, despite the longest travel itinerary of the league’s season following a Sunday game last weekend, because I didn’t expect the Dockers to put up much resistance. I was wrong. I’m picking the Dockers in the upset. They should run the legs off the Lions in the second half, Q4 especially, and pull away in the end.